Gerster TechTex is your partner for special solutions and special requests in the area of technical narrow tapes.Our technological highly developed narrow tapes are being applied in various domains. One main focus is reinforcing materials for the composite-market.Another field of application is operating supplies based on narrow tapes, which are being used to increase the efficiency in the industry.Our diversified product range covers standards and special structures of glass, aramid, and carbon, as well as synthetic yarns, e. g. PES yarns.We also specialize in the composition and production of special solutions and special structures. 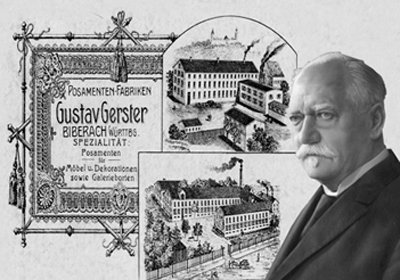 Gustav Gerster GmbH & Co. KG is a family owned company founded in 1882. It is now managed by the fourth GERSTER generation. Earning over 40 million Euros a year, Gerster is one of the leading European companies in the curtain, trimmings and curtain tapes manufacturing. Its top location is settled in the southern German town, Biberach. Gerster uses state-of-the-art production facilities satisfying the highest quality standards. In 2004, Gerster TechTex was created as a new business unit, specially conceived for the manufacturing of technical narrow tapes. One main focus of this new department is the use of reinforcing and auxiliary materials for the composite-market.